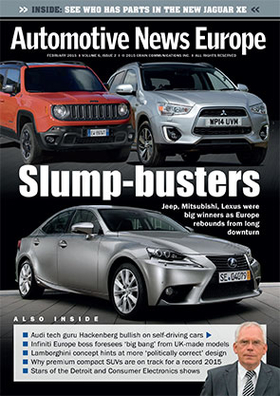 The latest issue of the Automotive News Europe monthly e-magazine goes live on Monday, Feb. 2. This month's edition looks at Europe's big 2014 sales winners and explains why 2015 is off to a positive start. In 2014, automakers in Europe rebounded from the region’s six-year slump. The brands that had the biggest sales percentage growth gains were Jeep (+70 percent), Lexus (+30 percent) and Mitsubishi (+25 percent). The brands that had the largest increases in volume were Renault (up by 73,231 units), Skoda (+70,968) and Dacia (+68,668). Helped by key new model launches, those three automakers accounted for 32 percent of the overall market’s growth of 669,568 unit sales to 13,006,451. Altogether, more than 80 percent of the automakers competing in the region reported a year-on-year increase. While industry watchers only see European sales rising slightly this year, companies including Ford and Fiat already are making positive moves such as increasing production and adding staff. There is no risk that Volkswagen will lose its place as Europe’s best-selling car brand, but the battle for second and third place is intensifying. Opel/Vauxhall and Renault are stepping up their efforts this year to replace Ford as Europe’s No. 2. Ford fought off both rivals last year and industry watchers expect the automaker to finish 2015 in second place again. Renault, however, will replace Opel in the No. 3 spot. We explain why. Stronger vehicle sales translated into big gains in shareholder value at most of Europe’s stock-listed automakers, suppliers and retailers, according to data from Automotive News Europe and PricewaterhouseCoopers. See which companies prospered most. This month’s edition includes interviews with top automaker executives covering a wide range of topics. Audi technology boss Ulrich Hackenberg provided his view on the future of fully autonomous vehicles. DS CEO Yves Bonnefont detailed his plan to make his upscale division of PSA/Peugeot-Citroen as important as Audi is to Volkswagen Group. Renault executive Philippe Prevel shared insights on how the French automaker is improving the quality of its vehicles. Infiniti’s Europe chief, Francois Goupil De Bouille, explained why he is so bullish about the forthcoming Q30 and QX30 compacts. Lamborghini design boss Filippo Perini wanted the Italian supercar maker’s first plug-in hybrid to have a unique look, one that steps away from the angular and aggressive forms of recent Lambos. Perini calls the Asteiron a more “politically correct” design and admits he took inspiration from one of the brand’s best-known models, the Miura. Sales of compact premium SUVs in Europe are poised to top half a million for the first time this year because of new model launches from brands such as BMW, Land Rover and Mercedes-Benz. The segment has expanded significantly since 2010, when about 270,000 units were sold. Analysts now predict sales will exceed 600,000 units in 2016. We look at the models that will drive the growth. Our Latest Launches section offers reviews of very different models. While competitors mull new SUV-styled coupes, BMW is about to debut its second-generation X6, the model that created the niche. Fiat adds 4wd to the fifth member of the 500 family, the 500X crossover. Mazda expects the new Mazda2 to make a bigger impact in Europe’s highly competitive subcompact segment thanks to a more aggressive design, improved interior and a wide range of safety equipment. The new Skoda Fabia highlights how the fast-growing Czech value brand is adding a touch of style to its cars, which until now have been known for their functionality rather than looks. On the supplier side, big changes loom at global leader Robert Bosch. When Rolf Bulander takes over Bosch’s auto division from Wolf-Henning Scheider in April, he will inherit a business that needs to do a better job leveraging its expertise.